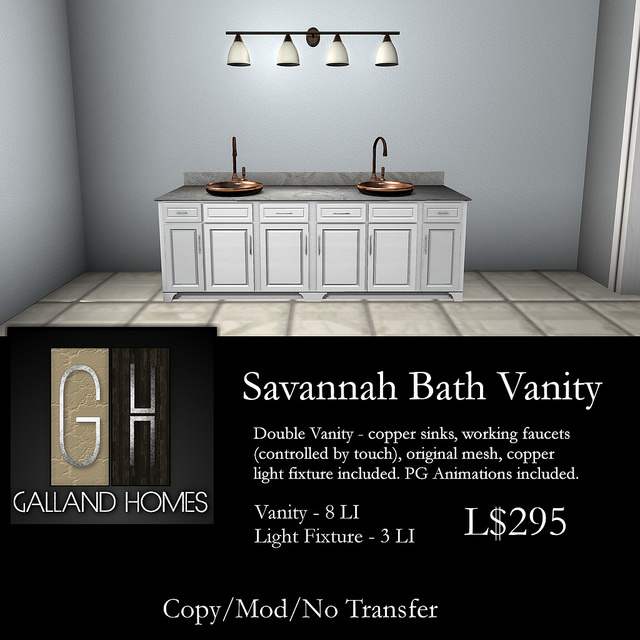 Galland Homes has the Savannah Bathroom Vanity Now available at the January round of the ULTRA EVENT. This luxury bathroom vanity with a double sink will be a great addition to your Bathroom Design. If you're looking for a little glamour and comfort in your bath, this release is a must have! the copper light fixture is included at 3 Land Impact. Thank you for subscribing to LTD! Second Life® and SL® are registered trademarks of Linden Research, Inc. LTD is not sponsored by Linden Research, Inc in any way.